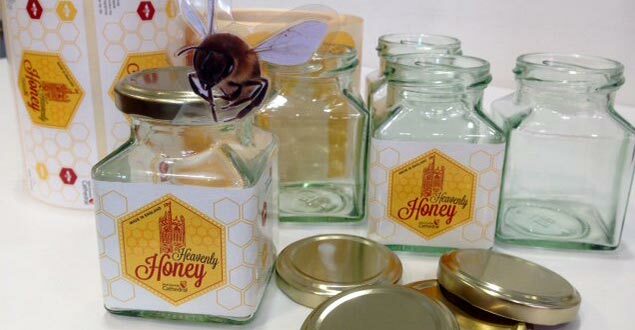 On Friday 12th October, a hardworking and committed workforce of Volition staff and volunteers bottled a grand total of 375 8oz jars from Manchester Cathedral, and a further 67 from Salford Cathedral, despite this year being a tricky one for beekeeping. Harvest is such a bittersweet time…and that is as true for the beekeeper as it is for the farmer. Harvest is the time to delight in the season’s crop and to enjoy its richness. But it is also a time of testing, when the skill of the farmer is measured against the year’s weather and the richness of the resources being nurtured. 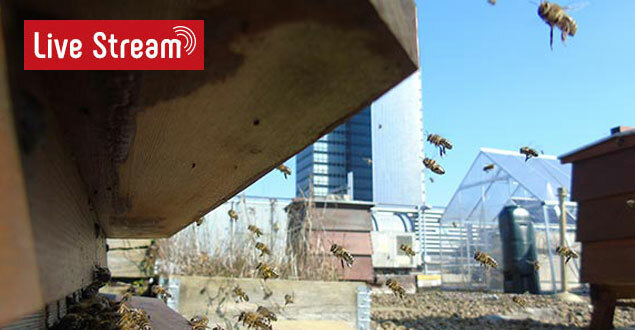 And it marks the end of the season – and the start of long months of virtually no beekeeping. This has been a poor year for bees. Though 2017 was a very good year for honey, many new queens from 2017 were poorly mated and were replaced. The year started late – but the long, very hot spell meant that there were fewer flowers and less nectar. And the Himalayan balsam, which bees love, didn’t perform well in the late summer. 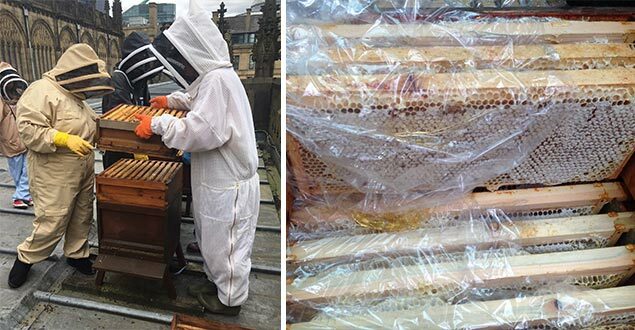 Nonetheless, we took our honey harvest off the beehives at Salford and Manchester Cathedrals, managing to pinch it without them really knowing, and we spun it out of the honeycomb one sticky day in late September. 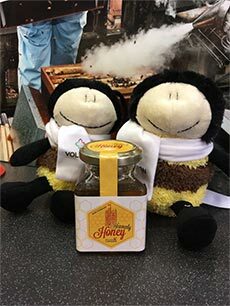 Then came the honey-bottling! It’s always a lot of hard work and needs a lot of resources to pull it off. However, it’s an excellent team task for the volunteers. We gather together a team of about 6 volunteers to form a production line: One takes the sterilised lids from the jars and feeds them to others. The next person – usually a staff member, so we know who to blame – fills (or spills) the jars. A third replaces the lids and cleans spilled honey off the jars. The next person dries them and ensures the lids are on really tightly. Two people put on the tamper-evident and main labels and lastly someone transfers them to boxes – in numerical order for quality assurance. Each volunteer finds their role and they look after and guide one another. They find that each person is essential to the task. If one person fails in the task, the next one can’t continue. They give feedback to each other and put effort and pride in getting the job done well. 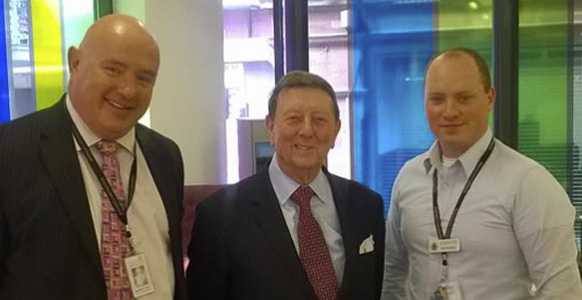 And we find that, in the common task, differences are minimised and all, staff and volunteer, become a team. 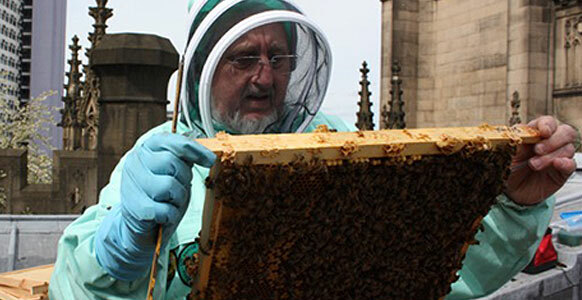 So it’s a rich experience, for volunteers and staff alike – let alone getting the honey crop sorted. The honey crop is not quite as good as last year: 375 x 8oz jars from the Manchester Cathedral hives and 63 from the new Salford apiary. But there is that ‘communal harvest’, which enriched us all. And all who helped, took away a jar of that golden honey – a token of what the bees have laboured for all year.